Experience hiking, outdoor cooking, campfires and swimming. Offered: Various dates on 3 day-sessions throughout the summer. Discover camp’s wild side! 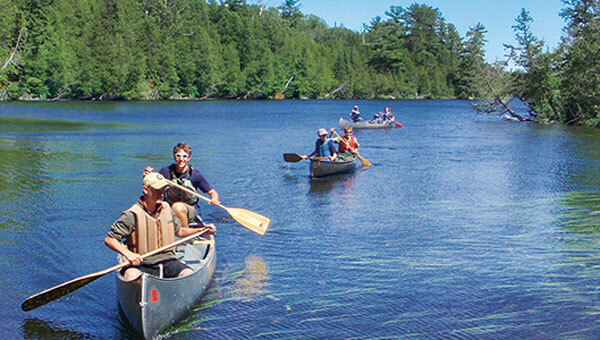 Participants enjoy 2 nights and 3 days of the great outdoors during Peak Adventure Camp. These camps promise unlimited fun. Sign up for one or all four. Participants will ride in a 15 passenger van departing from the Southdale YMCA in Edina. This adventure begins at Mystery Cave State Park near Lanesboro, where we’ll set up camp. Then we go underground to an exciting guided cave tour at one of the nation’s most unique caves. We’ll spend the next day renting bikes and exploring the historic town of Lanesboro and the trails and parks along the Root River. This adventure will take you soaring! Beautiful Interstate Park is our campsite for one night. We’ll enjoy the park’s rolling, wooded hills and the banks of the St. Croix River, and spend a half-day at Trollhaugen Adventures soaring through the Aerial Tour Challenge Course. Then experience a night sleeping at YMCA Camp Icaghowan. We will canoe and participate in camp activities. Truly a memory-making getaway. Fully experience the great outdoors. Tent camp for two nights with us at Devils Lake State Park in Baraboo, WI. On Tuesday we leave Southdale YMCA for Devils Lake State Park. Once camp is set up, the adventures begin! Wednesday is spent at a water park in WI Dells. We’ll explore the park and enjoy group games, hike and end with a blazing campfire and a hearty meal. Join us for this thrilling outdoor adventure! The starting point for this North Shore adventure is the spectacular harbor city of Duluth. There are so many fun things to see and do there. We’ll spend two nights camping at Spirit Mountain Campground. Our first day adventures include the Spirit Mountain Adventure Park and exploring Gooseberry Falls. On Wednesday we will spend the day on a guided kayak tour to local islands. This is a trip you don’t want to miss!